The first collegiate sailing regatta in this country was held in the waters off the Southport section of Fairfield, CT, but neither of the two schools in that shoreside town, Fairfield University and Sacred Heart University, has ever been a strong presence on the college sailing scene. 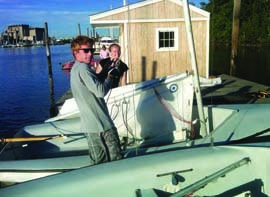 The SAIL BLACK ROCK Foundation, headquartered at Captain’s Cove Seaport in nearby Black Rock Harbor, aims to change that with high-level race training for collegiate and high school sailors. “Ginny Perry Worcester is our Race Training Director,” said White. “Ginny, who lives in Fairfield, was an Olympic contender in the Laser and she’s a match racing champion. There are a lot of sailors who have the skill but they can’t convey it, but Ginny is a professional educator. She gives wonderful chalk talks, she knows how to deliver the information in a way that’s compelling and exciting for the sailors, and she knows how to motivate them. To make a donation to the SAIL BLACK ROCK Foundation or to volunteer, contact DaveWhite atdave@dhwhiterealestate.com.